The law is social profession – there is no way around that fact. From the moment you step onto campus at Loyola, you start building your network of friends, professors, mentors, and colleagues. Your network is certainly crucial for client referrals and potential job opportunities but it’s also an important way to help deepen your knowledge of the law and to keep your spirits up. Luckily, the 1L experience is pretty much tailor-made to help you establish your network from day one. Before the start of the school year, the 1L class is broken up into four sections of about 65 students each. The people in your section inevitably become your first and most important network for your 1L year. On the first day of orientation, it’s only natural to look for people from your section. I happened to strike up conversations with people from my section who, like me, were in their mid to late 20s and had worked before starting law school. Within about an hour of check-in, I had met almost everyone who would become the core members of our study group. Of course, we joked a lot about how “old” we were compared to the students fresh from undergrad and, just like that, “The Geriatric Society” was born! Generally, our study group added more structure to my daily life. During the semester, we would plan schedule to work on our memos together, go over case briefs, and fill in our outlines. In order to contribute positively to group discussions, I had to create artificial deadlines and steady work schedules to stay on track with my reading, research, writing, outlining, and reviewing. This was especially true before midterms and finals, but the consistent study sessions definitely stabilized and spread the workload. Similarly, it was also helpful to have a group of friends who could remind me about important or interesting events like mandatory 1L meetings and visiting speakers. Beyond studying, we also just enjoy each other’s company a lot! 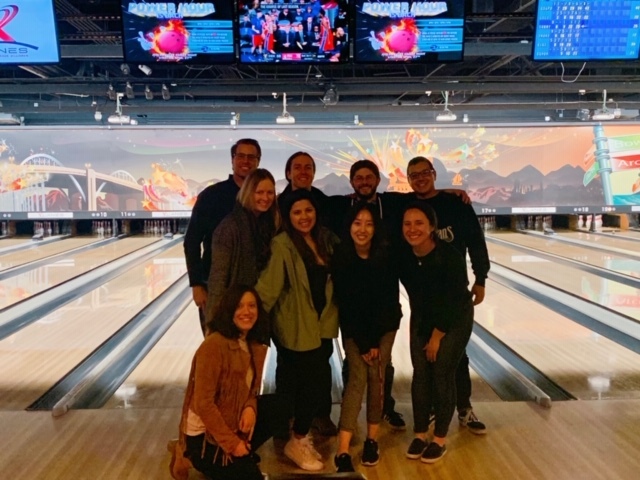 Some of our extra-curriculars have included happy hours, dinners, game nights, Rams football parties, Universal Studios, and bowling with plans for more game nights and karaoke night. We even made a group bid at the PILF auction to win a dinner with Prof. Levenson and her husband, Dougie! Needless to say, we take law school very seriously but we always make sure to loosen up and enjoy the ride.